When you're done with your RV for the season and ready to put it in storage, there is no better form of RV storage than indoors. At Vines Storage in Redlands, California, we provide an inside RV storage facility for individuals to store their vacation investments when not in use. There are many benefits to storing your RV in an indoor facility. Leaving your RV outside in the sun and rain will do more harm than good. Outside RV storage will not protect your RV from the elements, and weather may cause your RV to rust, chip, and experience hail damage during those strong summer storms. It is essential that you keep your investment looking great, and by utilizing inside RV storage in the Redlands area, you will be able to protect it from the weather that can cause your RV to look old or worn down. In some areas of Redlands, it is actually illegal to park your RV on neighborhood streets or driveways in many communities. By investing in inside RV storage, you will not only be able to protect it from the elements, but keep yourself legal in your community and keep it out of the way of your neighbors. One highlight that many people enjoy with inside RV storage is that of security for their vehicle. With indoor storage, your RV will not be tampered with or broken into due to being in a public location. At Vines Storage, we make sure your investment is cared for and kept safe from both the elements and unwanted guests. Speaking of unwanted guests, many RV owners enjoy utilizing indoor, climate-controlled RV storage in order to keep rodents, bugs, birds, and other pests from overtaking the RV when not being used. Additionally, your tires will be in better shape with indoor storage, as well as protecting your roof, paint, and the overall vehicle from the changing seasons. At Vines Storage, we understand that your RV is a huge investment that you want to take care of for years to come. By using our indoor RV storage, you can keep your RV looking great, running great, and in excellent shape, extending the life of your recreational vehicle by several years versus outside storage. 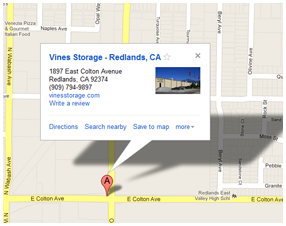 Call today to learn more about our indoor RV storage facility in the Redlands area.